The University of Georgia College of Engineering offers more than two dozen scholarships annually for undergraduate students. ► The deadline to apply for scholarships is February 28 each year. The Omotola Taofeqat Aderibigbe Engineering Scholarship honors the memory and dreams of Omotola “Baby T, Omo T” Taofequat Aderibigbe whose ambition in life was to attend college and major in engineering. As a lasting remembrance of a life that blessed and touched so many, this scholarship provides support to an incoming underrepresented or international freshman student majoring in Engineering in the University of Georgia’s College of Engineering. The scholarship is renewable for up to three years, providing the student remains in good academic standing. One award to an Agricultural Engineering major who has selected the Electrical and Electronics Systems area of emphasis. Recipient is selected based on leadership, financial need, and academic performance. The Barnie and Carla Beasley Scholarship for Engineering Excellence provides support to student(s) enrolled in the College of Engineering at the University of Georgia. Criteria for the scholarship: a student enrolled as a freshman (i.e., first year students) in any Bachelor of Science degree program in the College of Engineering is eligible to apply for the scholarship(s) to be provided during their sophomore year (i.e. second year student). The recipient(s) is eligible to apply for a scholarship for their third year and their fourth year. Selection will be made by the Engineering Scholarship Committee based upon the applicant’s academic performance, demonstrated leadership potential, and a 1-page statement describing the applicant’s interest in applying engineering principles in their chosen field of study. Preference will be given to a female student. This scholarship is to provide financial assistance to a rising junior or senior majoring in Biological Engineering. Selection of the recipient will be based on academic performance, leadership, and financial need. This fund shall provide a need-based scholarship for a current student in the UGA College of Engineering. The recipient will be eligible for a renewal of the funds each year, as long as they continue to display need and maintain satisfactory progress toward their engineering degree. The David Green Clements Scholarship in Engineering will support a rising Junior or Senior majoring in Agricultural Engineering within the UGA College of Engineering. Applicants will submit a one-page statement in support of their application to receive the scholarship award. Recipient selection will be made by the Engineering Honorifics Committee based upon the strength of written statements and demonstrated leadership potential. The purpose of the Dire Needs Project Award Fund is to identify and fund the most outstanding projects which will serve and make a lasting impact on dire human needs of people outside of the United States of America. Applicants must submit a 1,000 word essay, a detailed budget, and approval of a faculty member who will oversee the project. One award will be presented to a recipient selected by the Engineering Honorifics Committee. One award (depending upon availability of funds) to a freshman or sophomore in Agricultural Engineering. This scholarship provides an understudy type experience between the Scholar and Mentor (faculty member) and may be continued for up to three years. Selection is based on scholarship, financial need and future potential. Two awards, one to an Agricultural Engineering major and one to a Biological Engineering major, to provide financial assistance to individuals who have financial need and who have demonstrated a potential to contribute to the agricultural engineering profession. Four awards: two to an Agricultural Engineering major and two to a Biological Engineering major. Selection is based on scholarship, participation in student club activities, and future potential. The purpose of the Georgia Power Engineering Scholarship Fund is to provide scholarship support to student(s) enrolled in an engineering degree program at the University of Georgia. The criteria for awarding the scholarship will be either: (A) a student(s) enrolling as a freshman (i.e., first year student) in an undergraduate engineering degree program; or (B) a student(s) currently enrolled as a freshman (i.e., first year student) in an undergraduate engineering program. The recipient(s) is eligible to apply for the scholarship for their second, third and fourth years based upon the year of initial award, i.e. first year student or second year student. Selection will be made by the Engineering Scholarship Committee based upon the student’s academic performance and a one-page statement describing their interest in engineering and their engineering career goals. Established in memory of the son of Frank and Robin Ginn, the Stephen Harrison Ginn Memorial Scholarship in Engineering provides support for a student or students entering their fourth year within any undergraduate program in the UGA College of Engineering. The recipient(s) must be a Georgia resident with a grade point average of 2.5 or higher. Applicants must submit a one-page essay, highlighting their leadership experiences and impact expected from receiving this scholarship award. This fund shall provide scholarship support for exceptional students majoring in any degree within the UGA College of Engineering. Students who receive these funds will be denoted “Madray Scholars.” Two scholarships will be awarded each year to students based on high academic achievement and potential for leadership service. Preference is given to students residing from South Georgia. Recipients are eligible for the scholarship for only the upcoming academic year in which he/she applies, and so long as he/she remains in good academic standing at the conclusion of the first semester. Previous recipients are required to re-apply and compete for the scholarship each year. One award to an entering freshman or rising sophomore majoring in Agricultural Engineering. Recipient is selected based on leadership, financial need, and academic performance. The Red Clay Consulting Leadership Scholarship in Engineering provides scholarship support as a manner of recognizing future engineering leaders in the College of Engineering. Students majoring, or intending to major, in any of the Bachelor of Science degree programs within the College may apply and must submit a personal statement describing their interest in applying engineering principles in their chosen field of study, their leadership philosophy, the leadership roles they have filled, and their leadership accomplishments. Scholarships will be awarded by the College of Engineering Honorifics Committee based upon applicant academic performance and demonstrated leadership potential. Recipients will maintain the scholarship award for one academic year and are eligible to apply for the scholarship in subsequent years providing the student remains enrolled in one of the Bachelor of Science degree programs within the College. The Carl F. Riden Engineering Scholarship provides need-based scholarship support for students majoring, or intending to major, in any of the Bachelor of Science programs within the College of Engineering. To complete the application, interested students must submit a one-page personal statement describing their interest in applying engineering principles in their chosen field of study and the benefit they anticipate from receiving scholarship assistance. Three scholarships will be awarded by the College of Engineering Honorifics Committee based upon demonstrated financial need and personal statement. Recipients will maintain the scholarship for one academic year and are eligible to re-apply for the scholarship in subsequent academic years providing the student remains enrolled in one of the Bachelor of Science degree programs within the College. This scholarship is committed to creating and reinforcing a welcoming multicultural learning community within the College of Engineering. A “Diversity Scholar” receives financial assistance to recognize their academic achievement and potential for sharing their varied cultural perspective with the UGA engineering community. This scholarship is available to first year, transfer and continuing engineering students at both the undergraduate and graduate levels. Criteria for selecting Diversity Scholars include an academic record that demonstrates the potential for academic achievement. 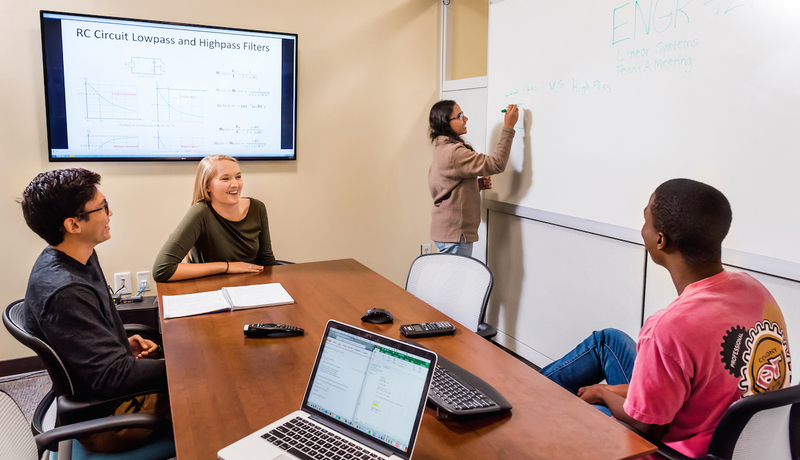 Each scholar must be enrolled in the UGA engineering program the first semester that the scholar enters the University and must be a member of an ethic group that is under represented in the College of Engineering. The financial assistance provided by this scholarship is renewable each semester based on the academic achievement of the scholar and the scholar’s progress toward earning an engineering degree. This scholarship is committed to recognizing and supporting student activities that combine learning with leadership. A Leadership Scholar receives financial assistance to recognize the recipient’s contributions and service to the College of Engineering, the University of Georgia and the Athens-area community and their academic achievements. The scholarship is available to continuing students both at the undergraduate and graduate levels. The selection criteria for a Leadership Scholar are based on demonstration of strong and continued leadership and service to the college, university and community, and academic merit. This scholarship encourages and supports an engineering student’s desire to broaden their views and perspective of the world community. The focus of the scholarship is to help students move out of their academic comfort zone and to discover the far-reaching impact that engineering has on society. Selection for this scholarship is based on academic performance and need; preference will be given to students who select non-English speaking destinations and enroll in engineering coursework at those destinations. The financial assistance is provided to help off-set study abroad expenses not covered by other scholarships including the HOPE scholarship program. This scholarship is committed to encouraging and recognizing excellence in coursework, activities and leadership and is given to a senior level (at least 90 hours credit in major) College of Engineering student. This scholarship is based on leadership and activities within College of Engineering, across UGA, and the community. This scholarship is committed to encouraging and recognizing excellence in coursework, activities and leadership and is given to a College of Engineering student who has completed at least 60 and no more than 100 hours credit in major. This scholarship is based on leadership and activities within College of Engineering, across UGA, and in the community. This scholarship is given to a College of Engineering student who has participated or is participating in the College of Engineering co-operative education program. The student must have completed at least two engineering co-op terms. This scholarship recognizes excellence in the classroom as well as excellence in the co-op workplace. The award will be based on performance in coursework, input from the College of Engineering co-op coordinator, evaluations of the student by the co-op partner, maturation of the student in activities in the workplace and the student’s co-op portfolio. The Southern Nuclear Operating Company Scholarship provides support to second-year students enrolled in the University of Georgia’s Bachelor of Science in Environmental Engineering degree program who have completed their first-year of study within the program. Selection is based on the applicant’s academic performance and a 1-page statement describing the applicant’s interest in applying environmental engineering principles to achieving sustainable energy systems in the U.S. Recipients are eligible to apply for the scholarship in their third and fourth years of study. This scholarship provides support for undergraduates majoring in any degree program offered in the UGA College of Engineering. Recipients will be identified based upon high academic achievement and their potential for leadership service to the engineering profession. Scholarships may be renewable up to four years, assuming the student remains in good standing with the University of Georgia. This fund shall provide scholarship support as a manner of recognizing future engineering leaders and retaining top engineering talent in the UGA College of Engineering. Any accepted student entering his/her third or fourth year of study within any bachelor of science degree program in the College is eligible to apply for the scholarship(s). Applicants must submit a one-page statement describing their interest in applying engineering principles in their chosen field of study, their leadership philosophy, the leadership roles they have filled, and their leadership accomplishments. The recipient(s) shall remain eligible for the scholarship for two years, so long as he/she remains in good academic standing. Five renewable annual awards to outstanding engineering students who maintain permanent residency in the Walton EMC service area, which includes Athens-Clarke, Barrow, DeKalb, Greene, Gwinnett, Morgan, Newton, Oconee, Rockdale and Walton counties. The scholarship is available to students currently enrolled in the College of Engineering as well as high school students who’ve been accepted into UGA as intended engineering majors. Applicants must have a cumulative grade point average of at least 3.7. The scholarships are renewable for up to four years as long as the recipient maintains a cumulative 3.7 GPA and remains enrolled in one of the eight bachelor of science degree programs offered by the UGA College of Engineering. As part of the online application process, students must submit a one-page statement describing their interesting in applying engineering principles in their chosen field of study, their leadership philosophy, their leadership experience and their accomplishments as a leader. This fund shall provide scholarship support for students within the civil engineering program at the UGA College of Engineering. Criteria for the scholarship: a rising junior, senior, or graduate level student within the Civil Engineering degree program in the College, and possessing a minimum 3.0 cumulative grade point average, is eligible to apply for the scholarship(s). The recipient(s) shall be eligible for the scholarship for only the upcoming academic year in which he/she applies, and so long as he/she remains in good academic standing at the conclusion of the first semester. Previous recipients are required to re-apply and compete for the scholarship each year. ► The deadline to apply for these scholarships is February 28 annually. For more information, please email the UGA College of Engineering Honorifics Committee. Looking for information on scholarships for graduate students?